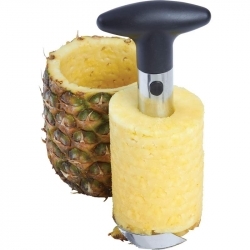 Use: Suitable for milling pepper, corn, mustard seed and other small sized spices. Material: Wood shell, aluminium and ceramic grinding mechanism. Usage: Unscrew the stainless steel nut. Open the round wooden lid, put pepper in it. The cover screwed on, Push turn right and turn round wooden cover. More spin several times, the crushed pepper. Features stainless steel and nylon construction. 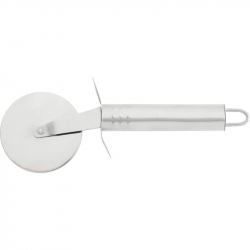 Includes soup ladle, solid spoon, slotted spoon, pasta fork, whisk, spatula, cheese knife, ice cream scoop, peeler, pizza cutter, grater, and can punch-bottle opener. Limited lifetime warranty. Ladle measures 3-1/2' x 12-3/4' x 1'. Gift boxed. Use this Marble Mortar and Pestle during meal prep to add a burst of flavorful spice to your recipes. Features polished exterior, rough textured stone for efficient grinding, and heavyweight construction. 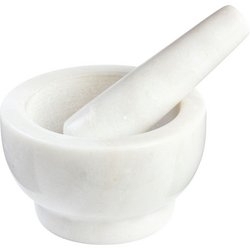 Mortar measures 5-1/8" diameter x 3-1/4", with 5-1/8" pestle. Limited Lifetime Warranty. White box. Julienne in a jiffy with this lever-operated Maxam(R) Vegetable Cutter tool, creating even cuts of a variety of vegetables. 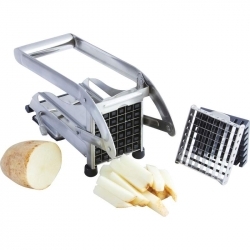 The Maxam(R) French Fry and Vegetable Cutter makes short work of creating your favorite sweet potato or russet fries, and quickly slices other vegetables for the party dip tray. 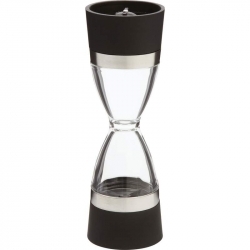 Features stainless steel construction, suction base, and 2 sizes of cutting grids. Measures 9-3/4' x 5' x 3-1/2'. Gift boxed. The Maxam(R) 3pc Small Household Scissor Set is one of our customer favorites. A must-have kitchen utensil for opening food packages, and an indispensable tool for the home office, sewing or craft room, you'll buy more than one set because this scissor set is so versatile. Soft-touch handles offer a safe, comfortable grip. Set includes an 8-1/2" pair of scissors and 2 pairs of scissors measuring 5-1/8" each. Limited lifetime warranty. Color card. Imagine an entire collection of kitchen tools, within arm's reach and instantly available for cooking tasks. 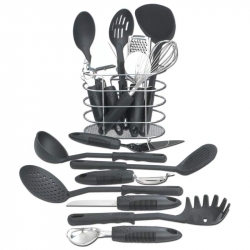 Place the Maxam(R) 17pc Kitchen Tool Set on your countertop and you'll never search through the utensil drawer in frustration again. 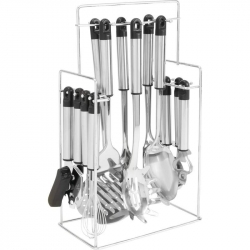 The contemporary wire storage basket holds 16 complete pieces: a solid and slotted spoon, a solid and slotted spatula, grater, cheese slicer, whisk, pizza cutter, bottle/can opener, pie server, vegetable peeler, strainer, ice cream scoop, paring knife, spaghetti fork, and ladle. Every tool a cook could ever need with an open stock value of $101.99! Basket measures 7-3/4' x 6-3/4' x 4'. Limited lifetime warranty. Gift boxed. 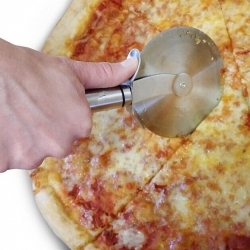 Peel, core and slice with one simple device! 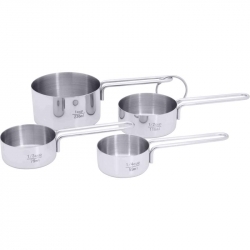 Features stainless steel construction and polypropylene handle. Measures 9-1/2' x 4' x 3-1/2'. Gift boxed. 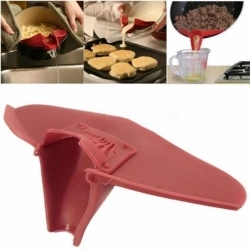 Ergonomic design with a nonstick wheel. Chef 's Secret(R) Acrylic Salt and Pepper Mill. Grinds salt, pepper or any dry spice on either end. Features twist-action top and bottom. Measures 3-7/8" x 7-3/8" x 3-1/8". White box. Features stainless steel construction. Measures 2-5/8' in diameter. 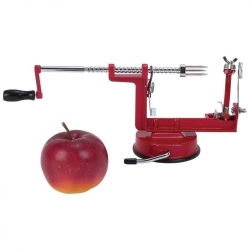 Peel, core, and slice an apple in seconds with the Maxam(R) Apple Peeler/Corer/Slicer. Features a suction base, razor-sharp stainless steel blades, chrome-plated winding rod, screw-on handle, and 3-prong extension. Measures 12" x 5" x 4-1/2". Gift boxed. 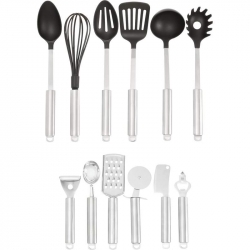 Includes soup ladle, solid spoon, slotted spoon, skimmer, meat fork, pasta fork, grater, pizza cutter, peeler, ice-cream spoon, bottle opener, whisk, and can opener. Iron stand measures 9' x 15' x 5-1/4'. Limited lifetime warranty. Gift boxed. 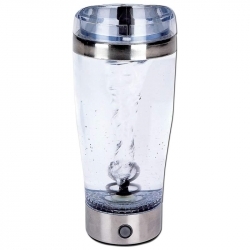 LaCuisine(TM) 18oz Tornado Portable Mixer Tumbler by Health Smart is a fun way to blend juice, water, or milk with protein powder for a healthy morning smoothie. The kids will have a blast mixing chocolate milk for a snack. Holds a generous 18 ounces. Features clear acrylic and stainless steel construction, and you'll be able to "see" the tornado in action! Requires 2 AAA batteries (not included). Measures 7-7/8" x 3-1/4". Gift Boxed. 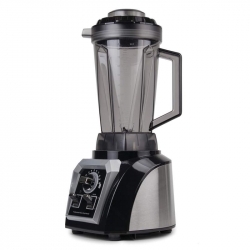 The 10 different speeds of the Chef's Secret(R) Multi-Function Multi-Blade Professional Blender will pulverize or liquefy whole fruits and vegetables in seconds or crush ice with a few pulses. Powerful enough to make various nut butters or nut flour, the 120V 60HZ 1500 full copper motor and multi-blades handle both wet and dry foods. Centrifugal friction cooks food naturally, a real time-saver in the kitchen when creating tasty soups and sauces. Retains vitamins, minerals, antioxidants and phyto-nutrients in food, contributing to a healthy lifestyle. BPA free, 2.25 liter Tritan Jar with measuring cup. Stainless steel and black in color. ETL certified. One Year Warranty. Gift box. 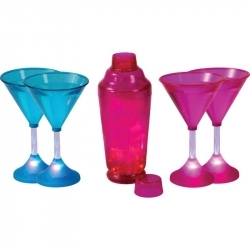 Set includes: one polypropylene luminescent martini shaker and 4 luminescent martini glasses. Features various light settings. Shaker stands 8-1/2' tall, 2-1/2' in diameter at base, glasses stand 6-1/2' tall, 2-3/4' in diameter at base. Requires 3 LR44 batteries (included). PVC display box. Makes it easy to pour and drain. Works on most pans, bowls and skillets. 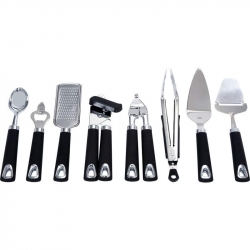 Set includes: tongs, ice cream scoop, can opener, bottle opener, garlic press, grater, cheese slicer/server, and cake server with serrated edge. Features mirror finish, soft-grip handles, and handy hang-up design. Tongs measure 10-1/2'. Limited lifetime warranty. $119.92 Open Stock Value. Gift boxed. Features key ring, welded handles, exterior volume information, mirror finish exterior, and satin interior. Set includes: 1 cup, 1/2 cup, 1/3 cup, and 1/4 cup. Limited lifetime warranty. White box. 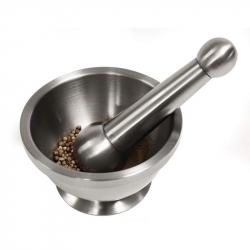 Grind herbs & spices in style with this sleek and shiny Maxam(R) Stainless Steel Mortar and Pestle. Perfect designer complement to your kitchen d'cor that is functional, too. Use fresh-ground herbs and spices in your recipes, and you'll be delighted at the depth of flavor the natural oils add to your dishes. Clean up is a snap with the smooth, stainless steel construction. Stylish wedding, shower, or housewarming gift. Set includes 5-1/4' mortar and 6-1/2' pestle. Limited lifetime warranty. Gift boxed.